My name is Mary. I have need having a hard time with my hard drive lately. It does not recognize Cd's in the drive, and it will not write anything to the disc's. I ran the PC Doctor today. It came back with the following errors. CD 523-5w CD523-6w CD523.7w and DW529-1. The last one could be RW-529-1, I may have written it down wrong. My drive is a Lightscribe DVD+-writer/CD-writer. I am using XP. I have a HP a1118x. My drive is HL-DT-ST DVDRRW GWA-4166B. I did a search on the internet and found out the codes mean I have the light heads are out of alignment.Can someone please help? I did a live chat with HP ad they told me I would have to take it to a service center. I really do not want to do that if I can fix it myself. If there is any other info that I may have forgotten, please let me know. I am not even able to open the drive at this point to remove the disc from the testing that I did. Optical drives are not made as well as they used to be...that being said it would be silly to have a shop repair the unit you have. Here is a link to current pricing on dual-layer drives and some are LightScribe...around 40 Bucks. And you could replace it yourself or have a friend do it in about 10 minutes. Thanks for all of your help. If I do relpace the drive, I will have to reinstall all of the windows programs right? I know how to replace the hardware, but i am not goo on the programing side. :0) Thanks again. if you are replacing the drive that reads your CD-ROMs, this is not the hard drive, but rather your "optical" drive, in common parlance. Your hard drive is probably just fine. You can just replace the CD-ROM/DVD drive with a new one. The computer will notice the change, but in it's modest gratitude it won't acknowledge it in your presence. - no need to reinstall windows. This is getting really complicated for me. Isn't the drive that reads the disks the same as the hard drive? If not please explain. Like I said, I am not good with the program side, but I sure can tear apart a computer and put it together again. I just did trying to "fix" the optical drive. :||Needless to say, I will have to buy a new one. Thanks for all of teh help! The optical drive reads cds and dvds. The hard drive has these big magnetic disks in them that store information. This is what a hard drive in your computer looks like, more or less (different brands look a bit different). Inside the unit are platters which spin, and there are little arms with "heads" that read the data. If you think of the old time record player with the arm and the needle on the record, the needle is like the head which reads the data on the disk. It's a rectangular box about five inches long, three and a half inches wide, and anywhere from a half an inch to an inch or so in thickness. Your LightScribe is a totally separate unit inside the computer case. 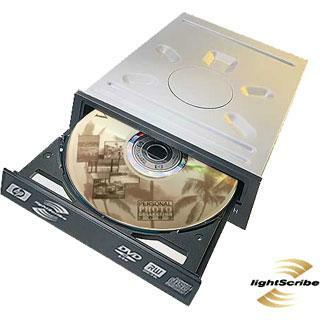 Optical drives use a laser to read and write the information to the discs. Some people make the mistake of calling the whole computer case, "the hard drive," and then they get others to doing it. It's understandable, but not accurate. Thank you, thank you, thank you. This really helps out. I understand now. This is a lot easier then I thought it was. There was a person near me that was giving away FREE computer parts. I didnot know what I was getting till I saw this post. I wound up getting a 18.2 GB ulta3 SCSI. 2 of them!! I was told I have to buy a converter (?) for them. What ever that means. I am really stoked about this!! Thanks for all of your help..
On the other hand, if you want to brag to your non-computer friends that you have SCSI (pronounced "scuzzy") drives in your computer, then they will think you are some kind of super-user! It may cost anywhere from twenty to thirty dollars - I haven't priced these in a long time! - to get the controller card. It may be cheaper to just try to get another conventional IDE hard drive. If you want the experience of "playing" with the SCSI, go for it! We'll help you out if we can! Thanks do much for everything. Actually I stopped by a computer store on my way home, and was told the hard drive was used for big corporations and it was junk. So it went to the recycle pile at there store. .The back area was different then the plugs I have on my computer, so I figured that it will not be worth it So I junked it. He said it was for about 200 drives. Of course I have no idea, but he seemed to know what he was talking about, and he owned the shop. So I trusted him. Thanks again for all of your help. I would have gone bald with out you. I was yanking my hair out till you came along!